There is no health without research, and since the establishment of the Pan American Health Organization (PAHO), in 1902, and of the World Health Organization (WHO), in 1948, research has been considered one of the six basic activities of these two international organizations. Moreover, the use of research has been crucial to fulfill the organization’s primary roles, aiming to achieve equity and health. Furthermore, research is a pilar to achieve the 2030 Agenda and the Sustainable Development Goals. Based on this theme, the Member States adopted the Policy on Health Research (CD49/10 and Resolution CD49.R10) in 2009, during the 49th PAHO Directing Council. This policy aims that PAHO/WHO (both the Member States and the Pan American Sanitary Bureau) to take into consideration research based on the new scopes and advances, and on the countries’ realities. Through this policy, scientific evidence ought to be the ground for policies, prevention and health care, together with good governance, regulation and accountability in health research. The Policy has a broad methodology of investigation “for health”, which comprises intersectoral work and it is consistent with the approach of determinants of health in all policies. The Policy places emphasis on strengthening the health systems by developing health research systems that are sound and sustainable, and in which research data are the milestone in all activities aiming at the highest level of health and equity (Policy in English) . The policy has six objectives and BIREME can contribute to all of them. Undoubtedly, the emphasis and impact of the Center work are reflected on objective 6 – “to promote dissemination and use of research results”. To promote the dissemination and utilization of research results. (7) To conduct and report infometric studies to broaden knowledge on the use of information. 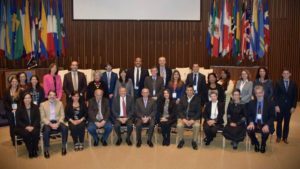 During the 46th Meeting of the Advisory Committee for Health Research – ACHR, held at the Pan American Health Organization headquarters, in Washington D.C., on November 28-30, 2016, we asked two focal points close to BIREME about the aggregated value of the Latin American and Caribbean Center on Health Sciences Information (BIREME).According to Dr Luis Gabriel Cuervo (PAHO/WHO Senior Advisor in Research Promotion and Development and ACHR Secretary), “BIREME has been crucial to enable the use of scientific knowledge in the Americas. For instance, by enhancing visibility of scientific investigation generated in Latin America and the Caribbean, using taxonomies and indexing, and opening access to global sources of information. Therefore, it can be used to orient decision-making processes. Furthermore, there has been a continued improvement in the Virtual Health Libraries, which enable addressing the local and regional levels, and allow us to benefit more from knowledge. BIREME definitely adds value to the countries and to science worldwide”. 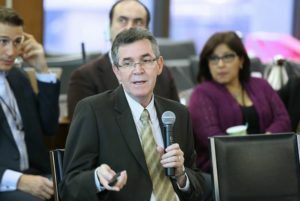 Dr Diego González, Director of BIREME, stated at the 46th ACHR Meeting that “BIREME’s actions in PAHO/WHO Health Research Policy are aligned with the primary mission of the Center; i.e., to contribute with the Region in making access, publication and use of information, knowledge and scientific evidence more democratic. Moreover, the center has much to offer on the development of knowledge integrating platforms, which display primary research data, publications, local evidence and policies, among others”. This reinforces the work developed by the Center’s interprogrammatic work, carried out in close collaboration with the research services at PAHO headquarters, represented by the Office of Knowledge Management, Bioethics and Research. In 2010, the General Meeting of the World Health Organization approved the Strategy of Health Research, developed after consulting PAHO. Both documents are in accordance and well aligned. 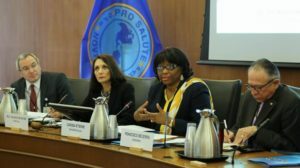 The preliminary evaluations show that PAHO Policy on Health Research is reflected on several advances and policy documents at local, regional and global levels. 1 Comment to "BIREME and the PAHO/WHO Policy on Health Research"